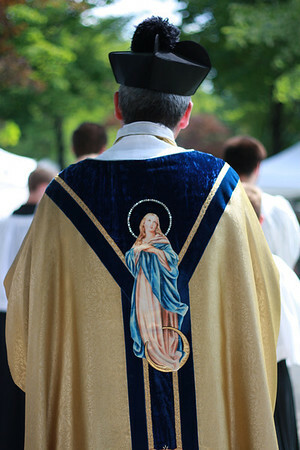 Following the Solemn High Mass in the Extraordinary Form*, which was also an orchestral Mass, the annual Corpus Christi Procession took place on the grounds of the parish. What follows is a collection of video snippets, mostly with added music because the wind made keeping the audio collected practically impossible. The last clip, which takes place in the parish Church, was preserved, despite the low quality of sound, and background noise. The audio doesn’t do justice to the beauty of several hundred people singing, “Holy God We Praise Thy Name,” following a Eucharistic Procession. Here is the video. Please, share this post, and the video below in email, social media and encourage people to follow GrottoCast for more media. Note also, that audio of Fr. 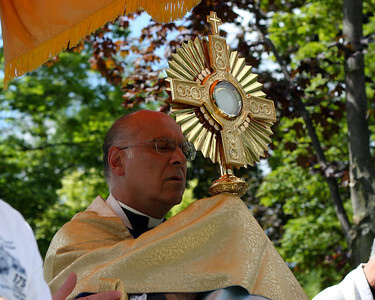 Perrone’s Corpus Christi homily from the 9:30 a.m. Mass was uploaded yesterday. Look for the option to toggle this video over to “HD” or 720, depending on the device you are watching on. On computers, it’s the little gear icon in the lower left corner; mobile devices might have an “HD” off to the lower right. This will provide the most crisp images. *Extraordinary Form Mass (1962 Missal, aka “Tridentine”) is usually celebrated at 9:30 a.m. on Sundays. One of a handful of exceptions when it shifts to Noon is Corpus Christi. Watch the Grotto homepage and bulletin for such changes. This entry was posted in Liturgical and Devotional Life, Solemnities, Video and tagged Corpus Christi, Eucharist, Eucharistic Devotion, Procession, Video. Bookmark the permalink.